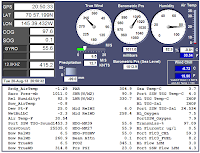 The image to the left displays our current position (latitude and longitude) as well as the current temperature, wind speed, and barometric pressure. Our current position is on the Beaufort Sea at a point near where the Mackenzie River empties into the Beaufort Sea. Click here to see a map. The ship, the crew, and the science team are engaged in full-bore instrument deployment at the moment. 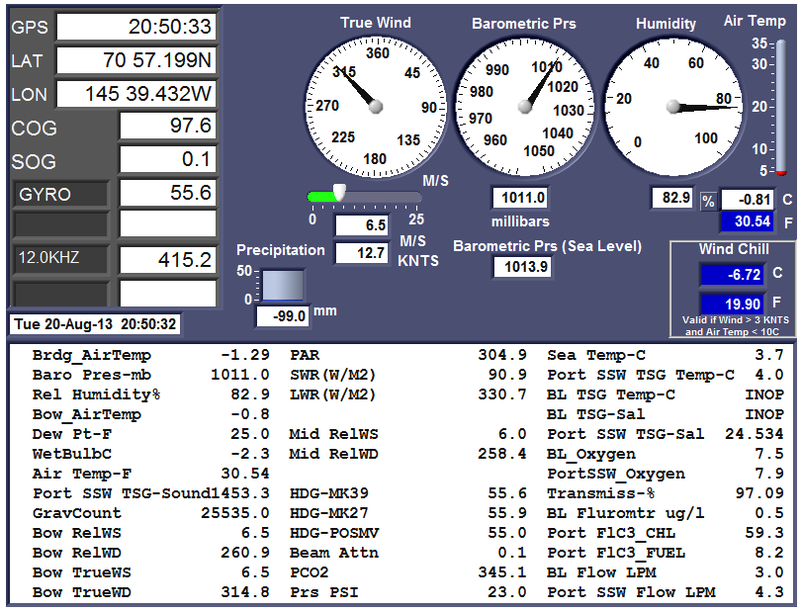 The gravity core, multi-core, and piston core instruments have been in-and-out of the water all morning and afternoon. Marti Jeglinski's team are busy taking the cores, labeling and storing the cores. Brendan Reilly has been scanning the cores, using an assortment of instruments, to determine the contents of the cores. Brendan does this without opening the cores. Ingenious. The reason we are here in the Arctic is to investigate the origins of a cooling period on earth, which began about 13,000 years ago. The cooling period, known by scientists as the Younger Drays stadial, has been associated with sea ice in the Arctic and North Atlantic Oceans, and the storage and release of fresh water from a large glacial lake in North America, yet its origin remains controversial. Dr. Lloyd Keigwin (Woods Hole Oceanographic Institute) and Dr. Neal Driscoll (Scripps Institution of Oceanography), principal investigators for the mission, hypothesized a glacial lake released fresh water to the Arctic Ocean through the Mackenzie River, and if supported, the signal should be detectable in the oxygen isotope ratio in the shells of plankton found in the sediment. Here's a video of what a transit day might look and feel like.